May today I find peace within. that I am exactly where I am meant to be. May I be content knowing that I am a child of God. and allow my soul the freedom to sing, dance, praise and love. 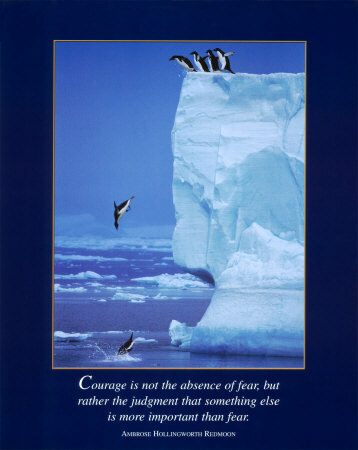 It is with the quote above that I start this post on being brave and courageous in your life. I too, like so many of you, stand on the precipice. As I stand here I remember that you are here with me as well, but that somehow doesn’t stop the thought – Gee, you would think that it would be easier by now since I have been here so many times before. Perhaps that is the definition of a life well lived….you stand here many, many times and have the opportunity to create your own unique leaping dance trusting that even if you fall on your face….. there will be a “lifting up” that inspires you to leap yet again. 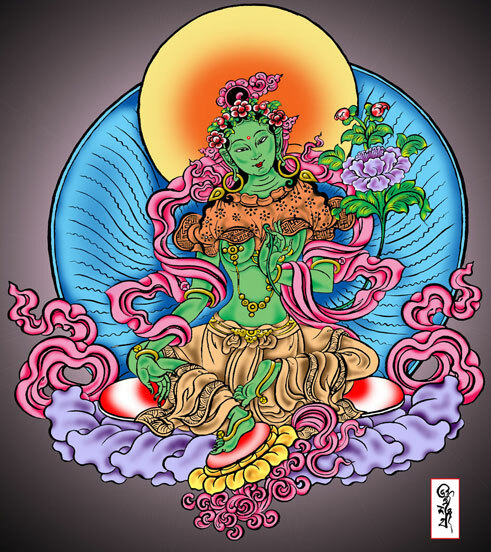 As Chameli Ardah states on her Awakening Women blog “the Green Tara above embodies the fearless and protective aspect of the feminine, but it is not courage which resists fear. If you think of fear and courage as two ends of a spectrum, we need to be willing to move through the whole range”. This means that standing in the fear is part of this leap process. Thus easy isn’t quite the word that defines this passage. I have learned that when we are seeking alignment with our passions and the Divine plan for our life, it is then that we consider taking those leaps and making those choices that bring us into the discovery of what that still small voice has been saying to us for oh so long. It is here that faith and trust in the wholeness of who we are comes into play. It is also here that we remember who we really are….and say YES! Yes, to the healing, yes to one more day to love and be loved, yes to starting over again one more time, yes to the creativity that sometimes rocks us with its insistence that it be brought out into the world, yes to the risk of finding more of who we are, yes to being vulnerable, being “seen” and surrendering the resistance, yes to giving back from a full place with every fiber of our being. It can come in big leaps, but also can come in stages like the walking of a labyrinth where each step brings you closer to the edge of discovery…and then to the heart of the matter. The clues are all around us right now. All we need to do is be still and listen carefully. The answer is always there. As you watch this video by Jana Stanfield remember that you are also one of these women that reached deeply inside, found her strength and courage, was not afraid to ask for support as needed, and leapt into Herself, settling into this Presence deep within your bones. Rock on!